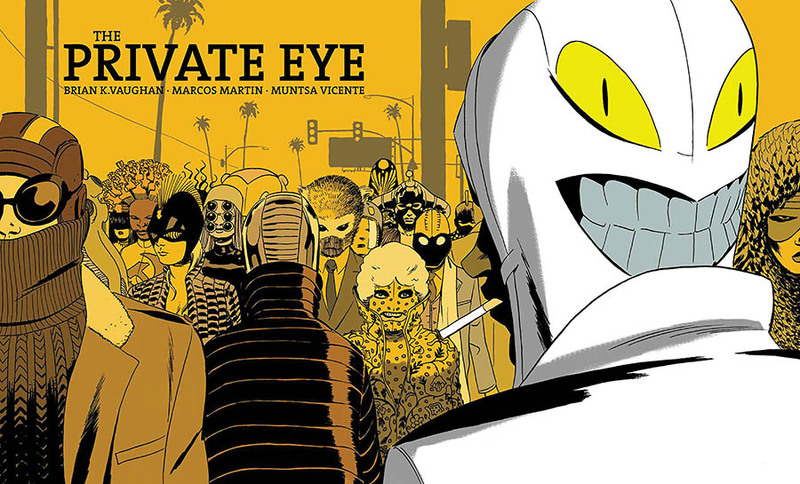 When Brian Vaughan and Marcos Martin started serializing The Private Eye on their website, panelsyndicate.com, I started to read it there, and loved it, but my deep aversion to reading books online left me downloading chapters but never actually getting around to reading them. Luckily, the series was eventually printed as this lovely landscaped hardcover, and I finally got the time to sit and pore over Martin's art the way I prefer to - on paper. The Private Eye is a pretty cool science fiction detective story. At some point in the future, the cloud will burst, and everyone's secrets, photos, and search histories will come pouring out, ruining a whole lot of lives. A while after that, all of American society will become obsessed with privacy, to the point where people adopt 'nyms' and walk around wearing masks all the time. There will no longer be an Internet, and most interestingly, policing and journalism will meld, with the 4th Estate investigating and prosecuting crime as well as reporting it. The series is centred around P.I., a paparazzo (independent private investigator) who, when a former client is killed, ends up getting swept up in a conspiracy involving teevee. The mechanics of the plot are fine, but not that important in a lot of ways. Vaughan's idea of the future is bizarre but always believable, and his characterizations are spot on, as always. P.I. is an interesting character, with great t-shirts, and his Internet loving, tattoo sleeved grandfather is a wonderful addition. Martin is the big hero here though, as he gets to design some incredible looks for people, and is given plenty of opportunity to do some wide-screen action sequences. This is a very good series, and if you aren't looking for the book, I strongly suggest you hunt down the comics online.